Interest rates are difficult to forecast. Many analysts build complex models. They factor in unemployment and other economic variables. But economic data is always months old by the time it’s released. And after release, it’s revised multiple times. It’s impossible to know what the economy is doing in real time. However, market data is an alternative to economic data. One advantage is that market data is immediately available. And market data is never revised. I think it’s best to use market data when possible. I do this with interest rates. And, as you’ll see, my market-based forecast is bearish for the economy. It’s also bad news for anyone looking at financing a big purchase after December. Interest rates are still near historic lows. But my forecast shows the Federal Reserve might lose control of long-term rates. The Fed is changing its policies, and it knows that could impact rates. My forecast lines up almost perfectly with the Fed’s plans to change its policies. The Fed doesn’t directly control long-term rates. Historically, it has only set short-term rates. But, after the financial crisis, the Fed adopted quantitative easing (QE) policies that acted on long-term rates. QE was, in many ways, an experiment. Based only on a theory, the Fed quadrupled the amount of assets it owns. Buying more than $4 trillion worth of bonds seemed to affect short-term rates, keeping them low. In the past few months, the Fed warned us it will be selling those assets. It believes it can do this without driving rates up by much. The chart below says it may be wrong. This chart shows the interest rate on 10-year Treasury notes. 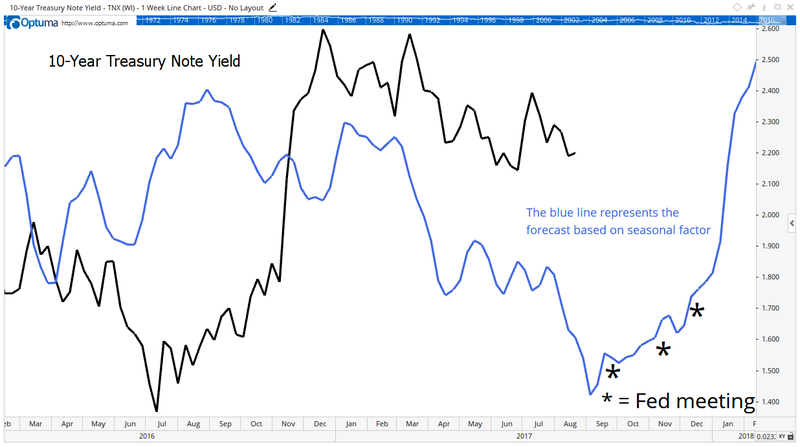 In the chart, the blue line is a forecast of interest rates based on a combination of seasonal tendencies and the recent market action. Seasonals are patterns in markets. The 10-year yield has been following the general trend of this indicator fairly closely for two years. Now, the indicator is warning the interest rate is about to jump. What could cause the Fed to lose control of interest rates? That’s an easy question to answer. And the members of the Fed know the answer. The Fed understands it has no idea how the market will react when it starts selling $4 trillion worth of securities. The Fed plans to sell the securities slowly. It thinks that will limit the impact on the market. But recent research calls that assumption into question. Economists at Wells Fargo found that the size of the Fed’s balance sheet drives long-term interest rates. There’s no doubt the Fed’s economists duplicated this study and know the dangers they face. A spike in rates is consistent with history. Lows in interest rates tend to be followed by rapid increases in rates rather than slow and steady gains. A rapid run-up in rates would be disastrous for the economy. Mortgage rates would rise, slowing home construction. Commercial construction would also slow. Auto purchases would suffer, as would sales of other big-ticket items. Rates are due to bottom in early September. They could double by the middle of next year. This forecast tells us unemployment will rise next year, and a recession is likely. Given this outlook, now could be the best time to lock in a mortgage refinancing or buy that new car.